Sometimes, sober hues and trendy designs are all you need to make a home stand out from its neighbours. And that’s what has happened with this comfy Polish property surrounded by manicured gardens. 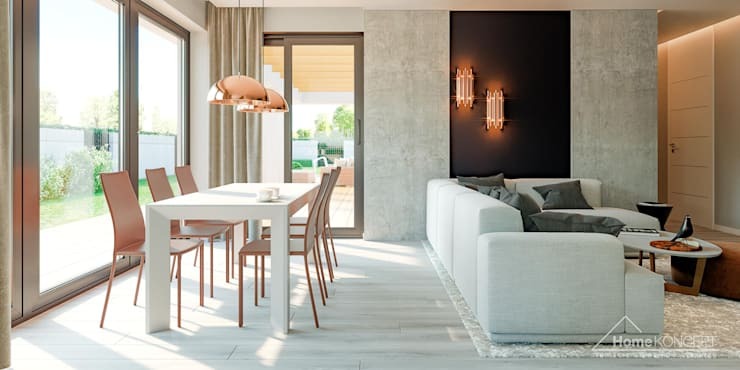 Soothing and different shades of white and grey create layered environments in each room, with sleek and elegant designs ensuring attractiveness. 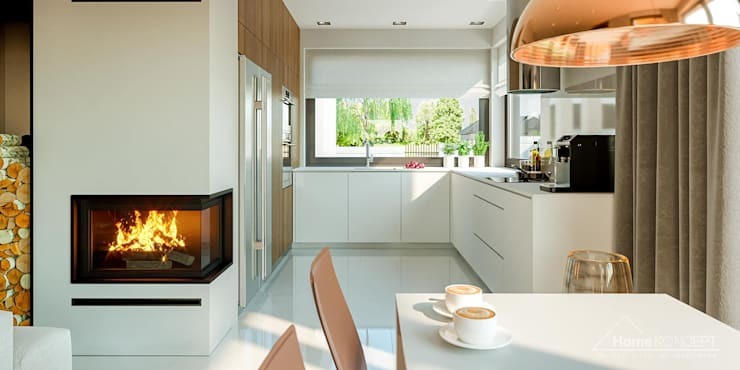 Wooden elements appear here and there to offer warmth, while fashionable fixtures in the kitchen and bathrooms express the owners’ love for all things stylish. Tasteful artificial lighting coupled with the presence of large glass windows keeps the house bright and cheerful at all times. Read on to know more about this splendid creation by the architects at HomeKoncept Projekty Domow Nowoczesnych. Sloping dark grey roofs and walls that combine grey and white tastefully help this spacious home to look inviting. Sleek white pillars line the approach towards the entrance, giving a trendy edge to the structure. A large wooden deck makes the backside of the house ideal for sunbathing, lazing around or entertaining guests when the weather is fine. Lavish amounts of glazing open up the different rooms to the lush green lawns and allow sunlight to flood the interiors. An open plan layout allows the living, dining and kitchen to merge seamlessly, while the garage is big enough for two cars. 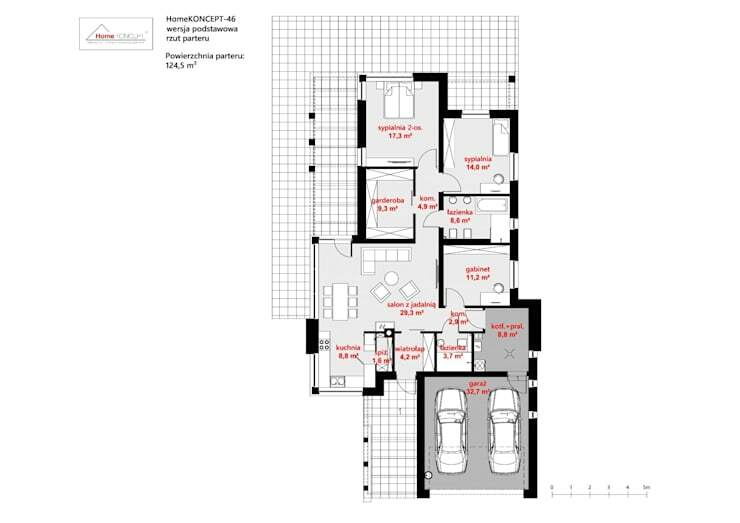 Two spacious bedrooms, two well-equipped bathrooms, a study, a dressing room and a utility room complete the layout. 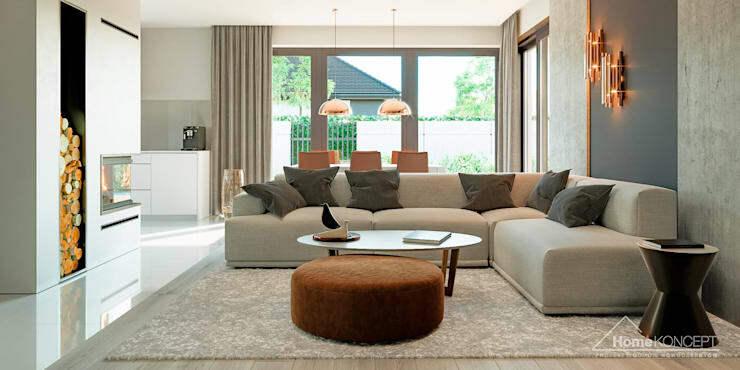 A stylish L-shaped sofa peppered with plump cushions and trendy coffee tables make the living space welcoming and cosy. 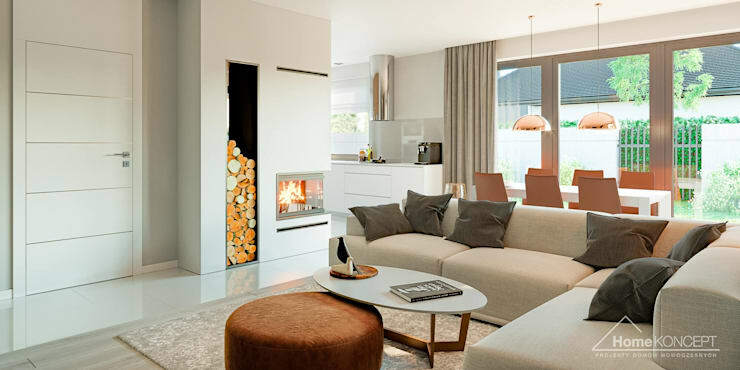 The inbuilt fireplace to the left offers warmth during cold months, and a slim niche has been created for storing firewood as well. The living area has been nicely integrated with the dining, to make the interior appear more spacious and bright than it is. Large glass windows flood the dining with sunlight, while the furniture is very minimal and chic. A pair of shiny copper lamps adds pizzazz here. From this vantage point, you can see how the dining merges with the kitchen, so that the 3 common zones lie in an L pattern. Large glass windows and lavish use of white make this kitchen bright and serene. The glossy cabinets are easy to clean, while modern appliances make cooking a fun experience. One of the kitchen walls has been clad with wood for a hint of warmth and to break the monotony of white. 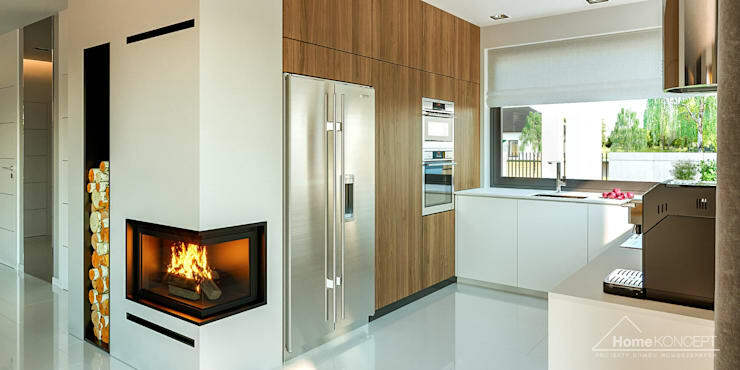 The trendy chrome appliances have been accommodated smartly into the customised niches built in this wooden wall. 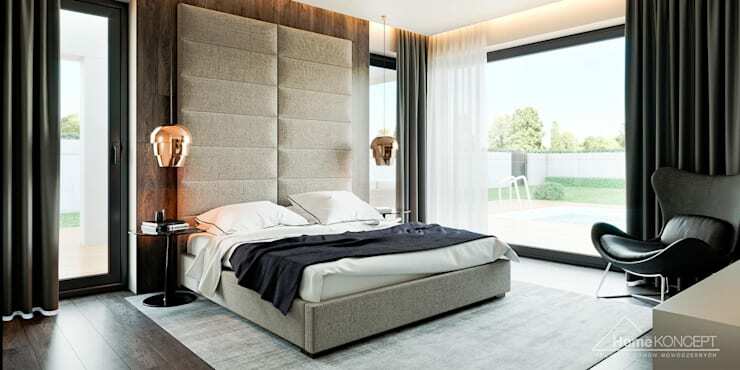 Grey, white and wood come together in this spacious bedroom to create a soothing and elegant atmosphere with minimal distraction. A massive glass window brings in sunlight, while the stylish chrome bedside lamps make the evenings romantic. The high headboard is padded for extra comfort. 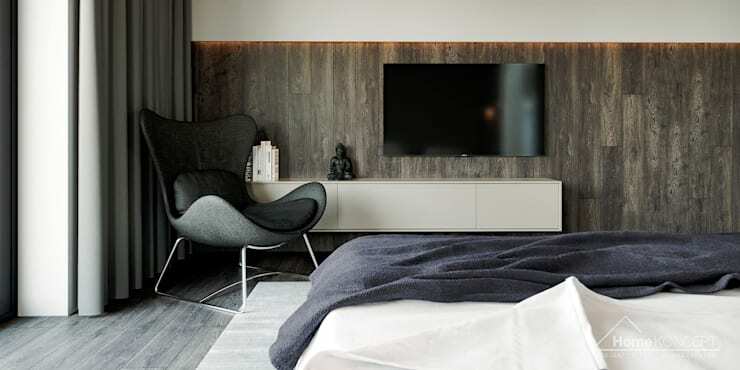 The wall behind the sleek TV unit is partly clad with wood for a cosy feel in this bedroom. A fashionable chair sits in the corner, ready for you to sink in with a book. 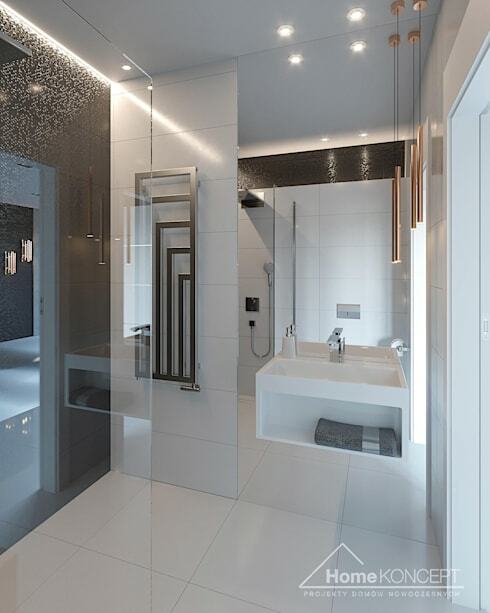 Gleaming white surfaces, ultramodern sanitary fixtures, and softly twinkling lights make this bathroom a luxurious escape from stress. 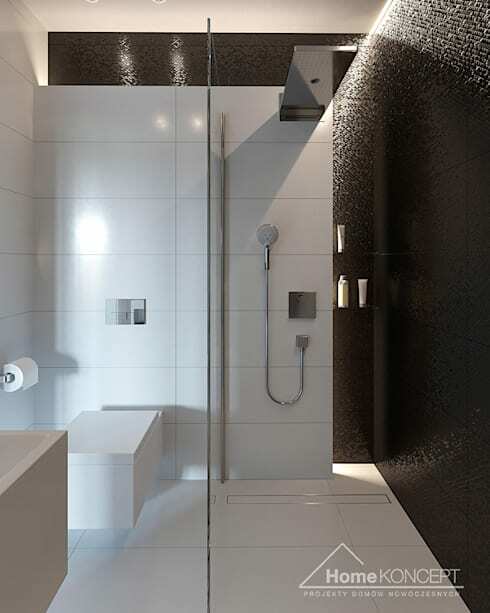 Two different floor tiles have been used to visually demarcate the shower area from the rest of the space. Appreciate the rustic stone-clad wall behind the sinks from this angle. It lends a whole new edge to the modern space, while the large mirror enhances the feeling of largesse. The shower nook is fitted with the latest fixtures and inbuilt niches to store gels and shampoos. 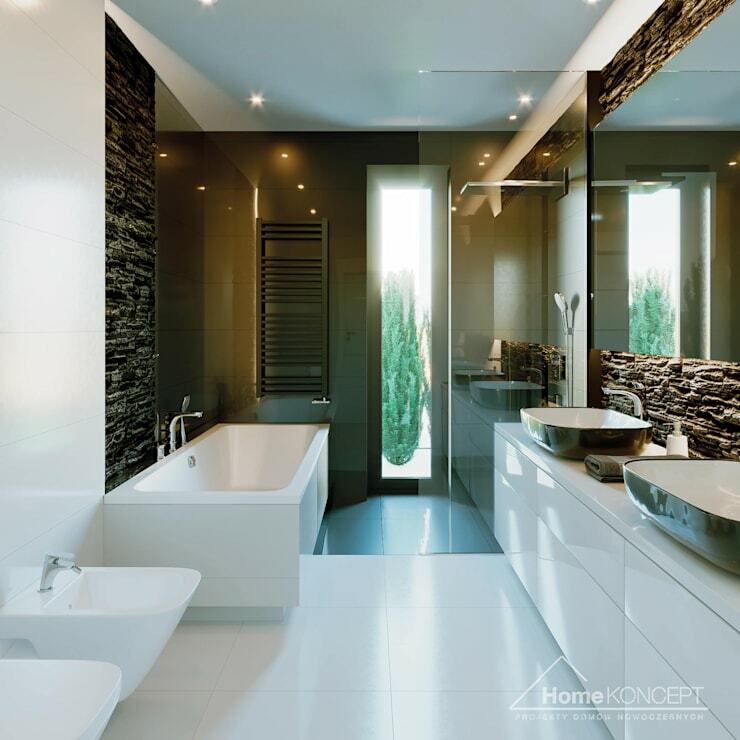 This small white bathroom has been equipped with neat and trendy designs, so that both comfort and aesthetics are taken care of. A floor to ceiling mirror and unique pendant lights add to the attraction. 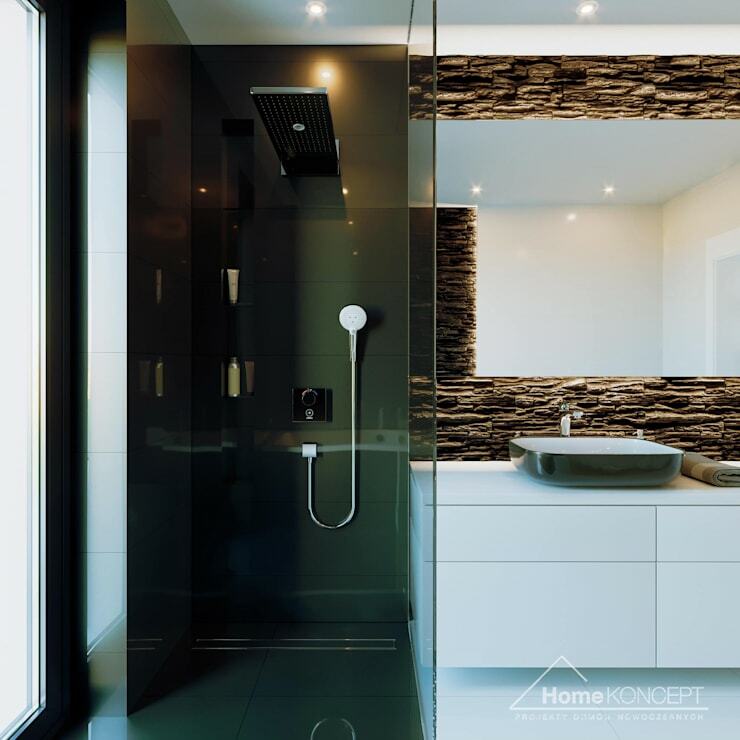 A sleek glass screen separates the shower from the modern WC. The wall to the right is clad with grey textured tiles for an interesting look.